The nation's 1,000+ Community Action Agencies are a robust state and local force-reaching children and families in 99% of America's counties with life-changing services that create pathways to prosperity. When disasters local communities, Community Action Agency staff move to respond, while they are also impacted personally. The funds raised here go to support agency and association staff impacted, so they can focus on helping their communities. Thank you for supporting these efforts! Donate 100% - Add 3% so that 100% of the donation goes to Community Action Partnership (National Office). 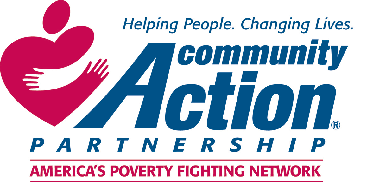 Community Action Partnership (National Office) has partnered with Network for Good to securely process your online credit card payment via Network for Good (tax ID 68-0480736). This transaction will appear on your credit card statement as "Network for Good." This transaction is subject to Network for Good’s Privacy, Security & Disclosure Statement and the Charitable Solicitation Disclosure.